Our management team, flush with over 40 years of combined experience in courier logistics, takes great pride in offering the highest level of customer service to our clientele and their customers. As such, we are able to maintain a loyal customer database through our ability to ensure prompt, reliable, pickup and delivery in all parts of the Greater Toronto Area. Our qualified drivers possess a vast amount of experience and we guarantee you will find them both professional and courteous to deal with. We maintain constant radio contact at all times through our Mike Communications Network. This, together with our real time computerized order processing system enhances our dedication to providing the fastest, most efficient service in all facets of courier pickup and delivery. 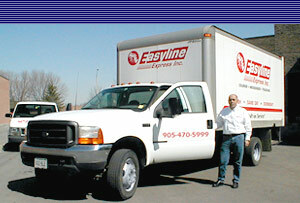 Easyline Express Inc. is committed to giving you the best service possible. We're here for the large corporation as well as the small business enterprise, or for the individual who requires the services of a courier once in a while. No matter how small or large, we treat every customer with care and consideration. Our customers have come to depend on our ability to handle all aspects of their delivery needs. Whether it's an envelope or an urgent delivery of a machinery part for your business, we do our utmost to make sure it's delivered quickly and safely. Easyline Express Inc. is commited to serving our customers with integrity and with appreciation to our employees, who continue to be the backbone of our company.